Full casting for the Australian Premiere Season of the Royal Shakespeare Company’s production of Matilda The Musical has been announced with rehearsals commencing in Sydney next week. Along with the four previously announced adult cast members (in alphabetical order), Marika Aubrey (Mrs Wormwood), Daniel Frederiksen (Mr Wormwood), Elise McCann (Miss Honey) and James Millar (Miss Trunchbull), we are delighted to now announce the remaining adult company: Stephen Anderson, Reece Budin, Rachel Cole, Andrew Cook, Danielle Cook, Eli Cooper, Cristina D’Agostino, Glenn Hill, Travis Khan, Nadia Komazec, Zoe Komazec, Leah Lim, Mitchell Mahony, Cle Morgan, Daniel Raso and Clay Roberts. 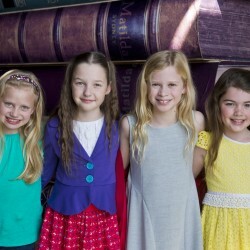 In addition to the announcement of the four young actresses who will share the title role of Matilda, (in alphabetical order) Molly Barwick, Sasha Rose, Georgia Taplin and Bella Thomas, we’re thrilled to reveal the young performers who will rotate the eight children’s roles of Bruce, Lavender, Amanda, Nigel, Eric and the other pupils at Crunchem Hall Primary School: Anthony Abrakmanov, Abigail Adriano, Maya Arya, Kyle Banfield, Eliza Carolan, Ayanda Dladla, Cody Ettingshausen, Joey Gandin, Alyssa Goodall, Ewan Herdman, Leyton Holmes, Zoe Ingram, Ruby Lahoud, Jacob Licastro, Shanice Lim, Amber May, Paris Naumovski, Erika Palma, Joshua Park, Ethan Puse, Zyon Rangi, Jack Reason, Callum Rogers, Regan Walker and Mei Yamada. The winner of over 50 international awards, including 12 for Best Musical, Matilda The Musical will make its Australian Premiere at Sydney Lyric Theatre from July 28, with tickets currently on sale from Ticketmaster for performances through to October 25. Matilda The Musical is based on the beloved novel by best-selling author Roald Dahl (Charlie and the Chocolate Factory, Fantastic Mr. Fox). It is the story of an extraordinary girl who armed with a vivid imagination and a sharp mind, dares to take a stand and change her own destiny. Having proven an enormous success in London’s West End and on Broadway, where productions continue to play to packed houses and capture the imagination of young and old alike, Matilda The Musical is the most-anticipated theatrical event of 2015. The New York production of Matilda The Musical opened on 11 April 2013 at Broadway’s Shubert Theatre to rapturous reviews and has been celebrated on 10 “Top Ten” lists for 2013, including TIME Magazine’s #1 Show of the Year. Sweeping the board at the 2012 Laurence Olivier Awards, winning a record-breaking seven awards, Matilda The Musical has gone on to take Broadway by storm, winning four Tony Awards® and a Tony Honor for Excellence in the Theater for each of the four girls sharing the title role. Matilda The Musical will be produced in Australia by the Royal Shakespeare Company, Louise Withers, Michael Coppel & Michael Watt with André Ptaszynski and Denise Wood as Executive Producers. The Australian premiere season of Matilda The Musical is proudly supported by the NSW Government through its tourism and major events agency Destination NSW. The Royal Shakespeare Company creates theatre at its best, made in Stratford-upon-Avon and shared around the world. Everyone at the RSC – from actors to armourers, musicians to technicians – plays a part in creating the world you see on stage. All our productions begin life at our Stratford workshops and theatres and we bring them to the widest possible audience through our touring, residencies, live broadcasts and online activity. So wherever you experience the RSC, you experience work made in Shakespeare’s home town. We encourage everyone to enjoy a lifelong relationship with Shakespeare and live theatre. We produce an inspirational artistic programme each year, setting Shakespeare in context, alongside the work of his contemporaries and today’s writers. We have trained generations of the very best theatre makers and we continue to nurture the talent of the future. We reach 450,000 children and young people annually through our education work, transforming their experiences in the classroom, in performance and online.